Having kids is supposed to be one of life’s greatest joys! 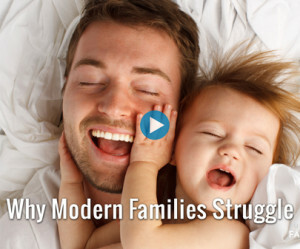 But for most of us, having a family is a remarkably tough experience. So often we find ourselves stressed, exhausted, fighting with our partner, and not experiencing the love and joy that family life can be. The love often withers in the face of the difficulty as we are left co-parenting and barely remembering the days before kids when we adored our partners. Fortunately, the root cause behind this predicament is quite simple and therefore very addressable. Today’s video outlines this cause and what you can do to have your family thrive.